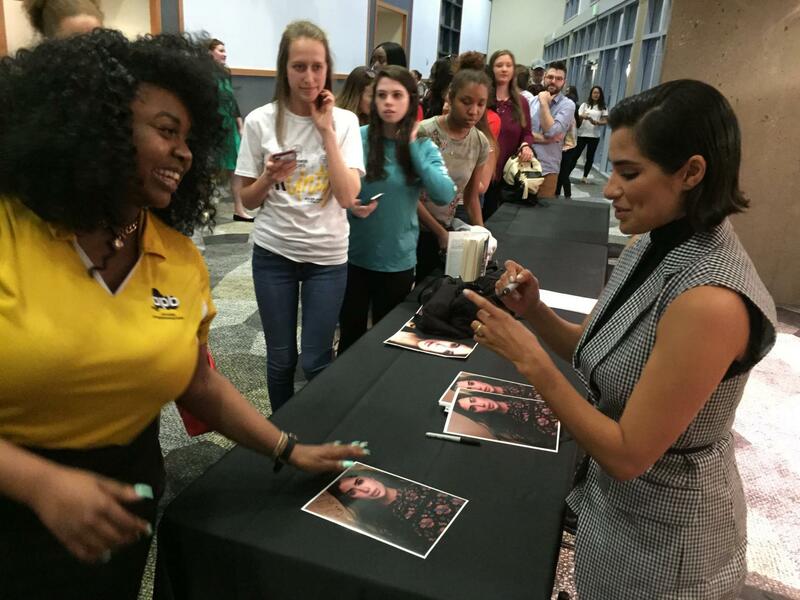 Diane Guerrero—known for her roles as inmate Maritza Ramos on the Netflix series Orange Is the New Black and Lina on Jane the Virgin—spoke at Northern Kentucky University about her recent memoir, In the Country We Love: My Family Divided, which shares her personal story in hopes of raising awareness on immigration issues and making change in the country. It was planned through Activities Programming Board (APB), who organizes a major event each year. On April 12, the event featured the well-known actress, author and immigration reform activist in the format of a one-hour moderated discussion. Around 200 students came to Student Union Ballroom to listen to Guerrero’s story. NKU associate professor Brandelyn Tosolt guided the discussion by asking Guerrero pre-selected questions that students submitted before the event. Most of the discussion centered around In the Country We Love: My Family Divided, which presents her personal story of the real plight of undocumented immigrants in the United States. Guerrero was born in U.S. in 1986 in Passaic, NJ and raised in Boston, MA. Her parents and older half-brother came from Colombia. After unsuccessfully pursuing legal US citizenship, Guerrero’s family was deported from the country when she was 14 years old. According to Guerrero, one of the biggest struggles that immigrants face now in the United States is surviving under the current Trump administration. She said that the administration pursues its own agenda, while using immigrant community as a scapegoat. Guerrero shared her personal story of the real plight of undocumented immigrants in the United States. Growing up in a poor family, Guerrero struggled to get an accessible education. She had to break through life’s challenges on her own. She said that being in college is already a major accomplishment, and she wants to share with students what she has done to become successful despite challenging situations. One of the main messages that Guerrero explained during her visit to NKU is that, as a nation, people have to participate and fulfill their civic duty in order to change the current situation. She added that one thing she said individuals can do is educate themselves by paying attention to what is going on in the communities and world. At the end of the event, Guerrero answered a few direct questions from the audience. Soon after, she talked to each attendee personally, giving out autographs and taking pictures. 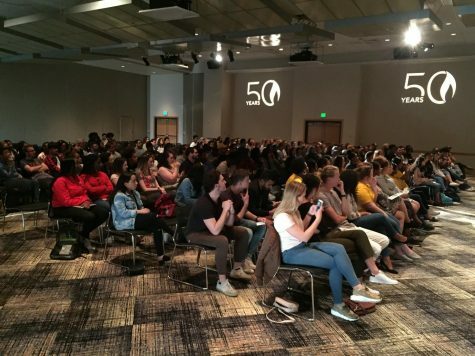 APB Coordinator Leah Koch, who helped to organize NKU meeting with Guerrero, said that the main goal of the event was to educate students and bring more awareness to the immigration situation in the country. Elijah Cane, a sophomore English major, was happy to get a picture with Guerrero afterward and receive her autograph. He said he follows Guerrero on Instagram and watched her act in Orange is the New Black, adding that this event was a good platform to raise an immigration issue. Freshman chemical engineering student Jordan Heller follows Guerrero on Twitter and watched two of her TV-shows. Heller was surprised to learn that Guerrero is a very down-to-earth person and has struggles like everyone else. . She said that in order to change the immigration situation we need to vote. Attendees gathered in the Student Union ballroom to hear Guerrero speak. Stacy Woodbridge, a junior marketing major and an international student from Trinidad and Tobago, came to the event with eight friends from different countries. She said that she enjoyed Guerrero’s strong message and wished that NKU would bring more people with stories worth sharing. Though junior CIT major Ismail Sidiya had never heard of Guerrero before the event, he was impressed that, despite major struggles and parents’ deportation, Guerrero found a way to be successful and become a famous actress. He said that these kinds of events bring more awareness to students at NKU. Last year, APB featured American actress and dancer Jodie Sweetin. She discussed with students her history of alcohol and drug abuse and talked about heroin epidemic issues. 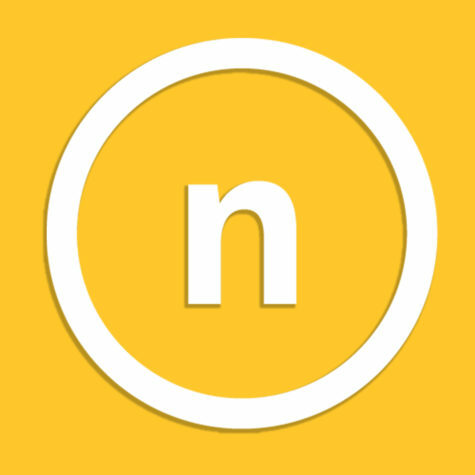 Activities Programming Board expresses its high appreciation to NKU Student Government Association, Alpha Psi Lambda, and NKU Study Abroad Program for funding, supporting, and helping to bring Guerrero to NKU.